My better half is working in Helsinki for a couple of weeks, so this weekend I went over there to see her and hang out. We did quite a few cool things that I want to share over the next few posts for the benefit of all by way of a recommendation. 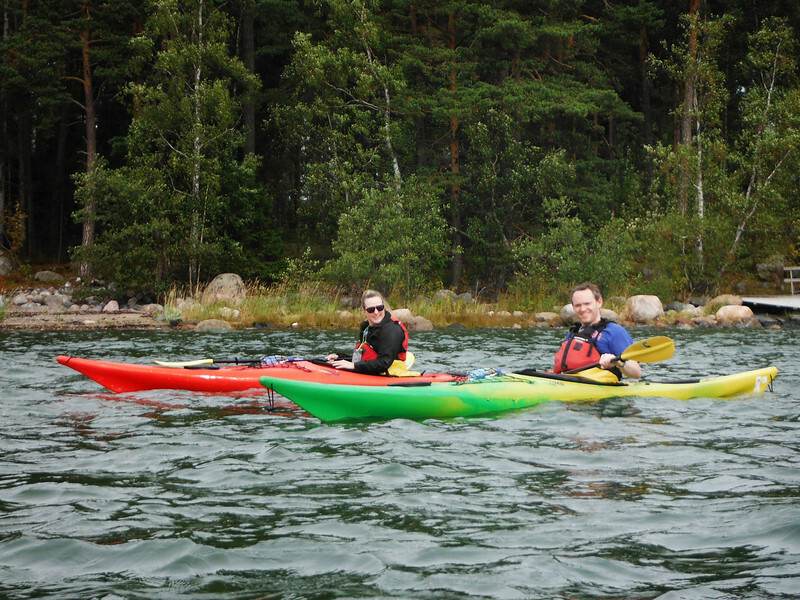 On Saturday morning we went kayaking in the Helsinki archipelago. We chose to book an organised tour from Natura Viva that included all transport from the city centre and all equipment for €65 per person. The minibus picks you up at 10am and takes you out to the paddling centre, dropping you back in the centre again afterwards. The online booking process indicates that groups can be as large as 8 at a time, but we were very lucky as no-one else had booked for our day, so we effectively had a private tour with our guide Matteo. 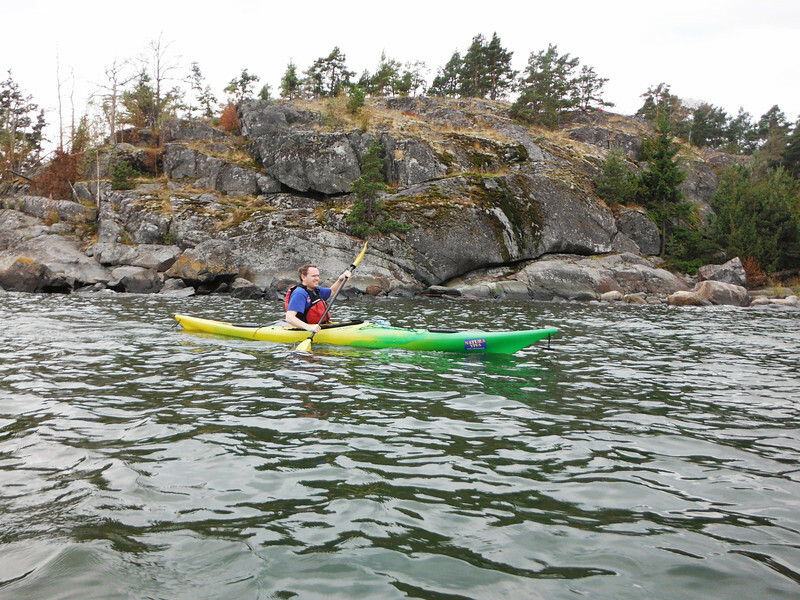 Since we both had some prior experience (I had kayaked once before; my fiancee several times before), the instruction given was brief and functional at the beginning, with further tips given as the tour progressed. 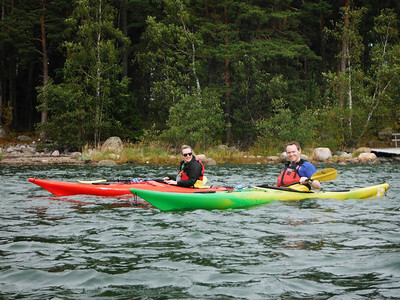 However, they cater to absolute beginners too, so please do not let the fact that you have not kayaked before put you off doing this! 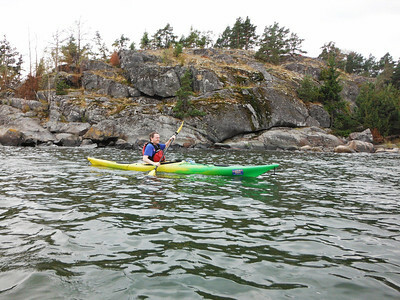 The distance you cover on the tour will depend on how fast you paddle, but for us it was about a 3 mile paddle out to the small public island where we stopped for lunch. The tour includes a lovely ham and cheese sandwich (tell them in advance if you are vegetarian), and a juice box. We were also given some sea buckthorn berry juice, but I’m not sure if that was part of the tour deal, or just the excellent hospitality of our guide! After lunch, you paddle back toward your starting point. You can stop to take a break at any time if you need it – something that I did regularly so that I could take pictures using my phone (for which I highly recommend an AquaPac to keep things dry while still allowing photos). The guide also takes pictures throughout the tour using a waterproof camera, and the centre emails you a gallery of the pictures to you after your tour – no rip-off prints here! Once you’re back on dry land, you are taken back to the city centre in the minibus. I recommend stretching and maybe having an upper body massage, since your upper body probably just got worked out harder than it has in a long time! Overall, if you have a few hours to spare across the middle of a day in Helsinki, I cannot recommend this activity highly enough.